In this concise and practical review, the authors recognize that among the range of cardiac investigations available to veterinarians, the standard electrocardiogram (ECG) is an indispensable, safe and inexpensive test in assessing dogs and cats with heart disease. Following discussion of the principles of electrocardiography, the book systematically explores the evaluation of the ECG?including determination of heart rate, measurement of intervals, derivation of the mean electrical axis, and criteria for atrial and ventricular enlargement or hypertrophy. It also examines intraventricular conduction disturbances and both normal and abnormal cardiac rhythms. Flow charts are provided to help users diagnose arrhythmias with confidence and 46 real cases and ECG tracings reinforce the principles and encourage discussion. 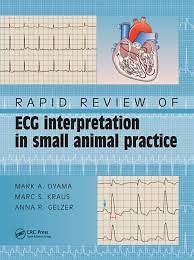 Rapid Review of ECG Interpretation in Small Animal Practice is illustrated throughout and is of value to all veterinary practitioners, technicians, and students who wish to improve their skills in interpreting ECGs.